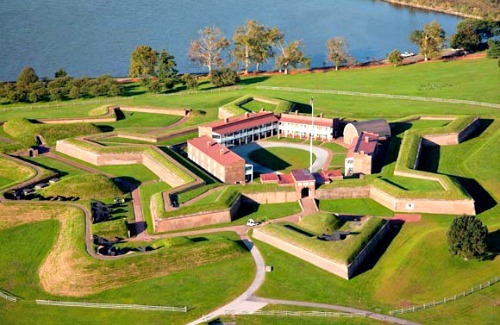 Fort McHenry was built by a French architect named Jean Foncin who designed the fort in 1798, with construction beginning the same year and being completed in 1800. It was built on the site of fort Whetstone which had become outdated and could no longer provide protection for the near by important port of Baltimore. The fort played a major role in the war of 1812 and at 6:00 a.m. on the morning of 13 September 1814, the British fleet attacked and bombarded the fort for 25 hours before trying to move past up the river. The fort was well designed and held off the British attack, leaving a trail of 22 sunken war ships and saving the port of Baltimore from capture. After the war everything was relatively quiet until world war one where over 100 buildings were built on the surrounding land as part of a plan to transform the fort into a giant hospital to treat returning troops. Today the fort is on the national register of historic places and is open to the public as a popular recreational spot and tourist attraction. Since most forts have seen some kind of battle in their lives theres always a basis for a good haunting, and Fort McHenry is no different. Even though the fort was never captured and in the war of 1812 there was no actual land battle, the fort still suffered loss's from the bombardment of the British naval attack. Another period of loss in the fort's history is when it served as a world war one hospital. Since its located right on the east coast and due to its size it became a major site of treatment for returning troops. Medical knowledge of the day and the lack of antibiotics led to many people dying from the operations performed and succumbing to their wounds. It is these past soldiers who are said to still haunt the fort today, with staff and visitors alike making some chilling claims. The most commonly reported paranormal activity at the fort is the sighting of apparitions, all of which are always wearing some kind of military uniform. There have also been claims of people seeing guards walking the walls and corridors with a weapon in hand, only to vanish when approached. The dungeon area of the fort is thought to be the hot spot, with people claiming they felt like they were being watched by unfriendly eyes and being overcome with sudden emotions of fear and sadness.